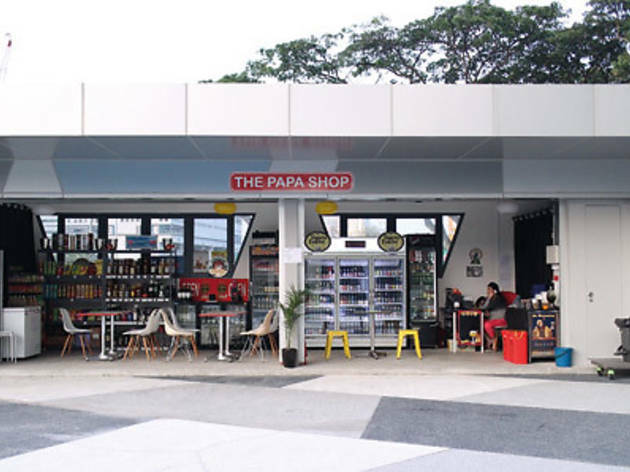 If the mama shop’s where you go to get your daily bread and necessities, The Papa Shop would naturally be the place you’d pick up your more fortifying sundries like booze. 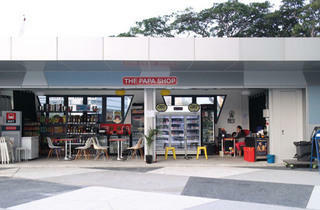 Fabio De Souza of the now-defunct Lil’ Papa’s Weiners teams up with his regular patron and Aussie actor Keagan Kang to set up a berms and flip flops-appropriate kiosk on the edge of the industrial sticks of Kallang, which offers outdoor seating for up to 50 people. In a few months, they'll also offer drive-by pickups (for online and call in orders) from their driveway (which leads up to the shiny new CT Hub building). The approach here, confirmed by its visual cues, is very DIY. Browse their extensive and rotational range of craft beers and ciders ($8-$14), wallet-friendly wines and sparklies ($25-$30) or artisan-centric spirits, pay for what you pick at the counter, and enjoy. Despite its simple, bare-bones concept, it’s evident that Papa’s got a taste for a finer cut with labels like Evil Twin ($9.90-$13.50) and Stone ($8.90- $10.90) beers, plus Great King Street whiskies ($79-$89) and Diplomatico Reserva rum ($105). For nibbling, there’s a full mama shop-style rack of Tong Garden nuts and junk snacks ($1-$4.50), though the shop also allows you to bring your own food from the nearby Lavender Street hawker centre or the CT Hub (or even McDelivery to the store if you want).